Our Cherry Tree: Primary School Places - What happened next? Unless you're the parent of a child starting school in September, it's likely that Tuesday 18th April passed you by unnoticed. 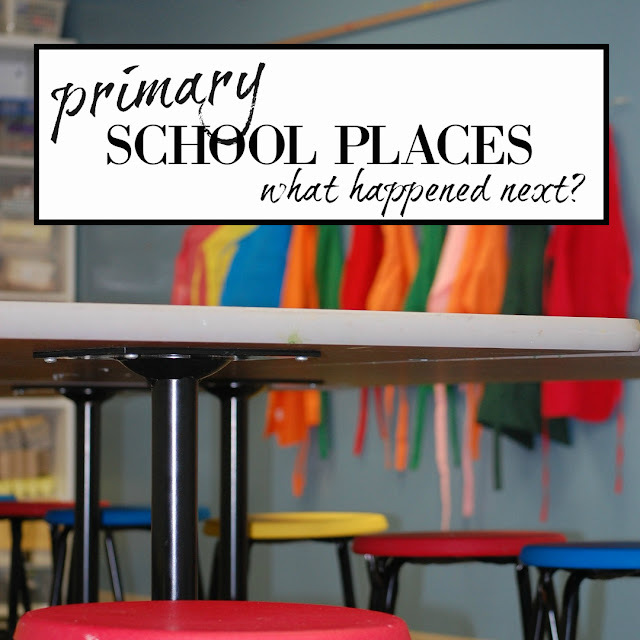 In previous years I have shown a slight interest in friends and family being offered primary school places but always assumed that the process was simple and straightforward. You picked a school in your local area, you get that school, right? It was only last year that the reality of the situation hit me. You don't choose your child's school. The county council computer picks your child's school. I'm sure it is a complex and carefully crafted algorithm. Designed to be logical and fair. But lacking in the sense checking and realities of a human presence. And you do get to tell them your favourites. Your top four preferred schools, listed in order after a lengthy process of reviewing websites, school guides, OFSTED reports and visits. In most cases you are likely to be allocated one of your four listed preferences. But in scenarios where the schools are particularly popular, or there seems to have been a bit of a baby boom on year, the computer will allocate you a place at the next nearest school that happens to have a place available at that point. I never expected this to happen to me. But it did. Lily was offered a school five miles away. An hour each way by bus. Two buses to be accurate. A grand total of four hours travel, eight buses and one hour of walking every single school day. In effect, the stuff school run nightmares are made of. And I tried to be optimistic but actually failed miserably. And was left with few choices. Reading this, you, like the majority of friends and family, may recommend me to appeal against the decision. The problem is, reception class sizes are set at a maximum 30 children per class by law. An appeal hearing panel will only bend this rule if there is a significant and compelling reason to do so. This is usually if you can prove that a mistake has been made by the school or council in processing your application. Unlike secondary school appeals where you can argue your point of view, reception class appeals do not take factors such as distance and whether you drive or not into account. Thus, only 2% of reception class appeals are successful. So we decided to stay on the waiting list for our catchment school. After the first allocation there are a further four rounds that take place. Your first choice may be someone else's last choice, a family may move out of the area, things do change. And we were extremely lucky that after just one additional round of waiting, Lily was offered a place at the school on our road. Saying I felt relieved does not do my feelings justice on this occasion. Even so I waited nearly a month before announcing the outcome to our wider friends and family. It wasn't until we'd met Lily's teachers and visited her school that I felt confident this was actually happening. That I wasn't facing a life of sitting on buses and waiting in the rain. And now I can concentrate on what really matters. Lily's excitement of starting school. Seeing her classroom, meeting staff, buying uniform, experiencing her first day. I can look ahead to helping in her class, listening to children read and attending stay and play sessions. I can't wait! This is the next big step - the next adventure for us as a family and I'm ready to make the most of it.